Mr. Baker is the founder of The Baker Law Group. His practice focuses on representing injured victims, class-action litigation and traffic defense. 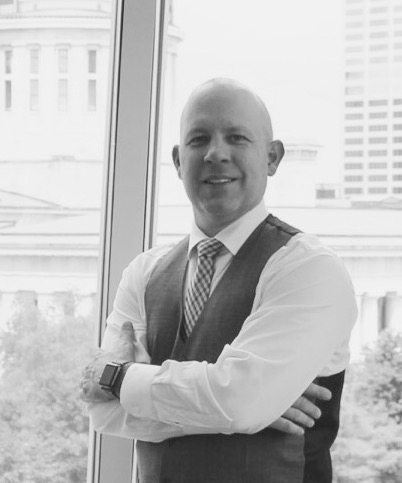 Mr. Baker graduated with honors from The Ohio State University Fisher College of Business with a Bachelor of Science in Business Administration. During his college tenure, Mr. Baker was a member of the Ohio State Crew Team. Mr. Baker graduated from Capital University Law School Order of the Curia, recognized for outstanding academic achievement. Mr. Baker is admitted in to the Ohio bar and he is licensed in the U.S. District Court, Southern District of Ohio. Mr. Baker is currently a member of the Columbus Bar Association and the American Association of Justice. He served a term as a member on the Columbus Bar Association Professional Ethics Committee. Mr. Baker is a staff lecturer at Driver Intervention Programs around Columbus educating participants about alcohol related traffic offenses. He also speaks at the annual Columbus Bar Association Legal Practice Lab on technology and client communication. Recognitions include: National Trial Lawyers Top 40 Under 40 for 2012, 2014, 2015 and 2016; Top Attorneys Ohio Outstanding Young Lawyer for 2013; AVVO Clients Choice Award for 2015 and 2016; Superb Rated Attorney recognized by AVVO 2014, 2015, 2016; and by SuperLawyers asa Ohio Rising Star 2012, 2013, 2014, 2015 and 2016. In addition to practicing law, Mr. Baker enjoys spending time with his family, boating, playing guitar with local artists, competing in marathons and triathlons and is an avid cyclist and snow skier who thoroughly enjoys outdoor recreation. His personal involvement in cycling prompted him to focus a portion of his practice centered solely around representing injured cyclists. He hosts an interactive iOS and Android cycling app, Cyclistdown. Further, as an experienced watercraft operator, Mr. Baker represents victims injured in recreational watercraft related accidents.